a thousand a year without knowing. We all make noises in our sleep. Snakes listen. hand me roses like mirrors, all false reflection. skin-scales. I’m following you on Twitter. as if I’d been stone. 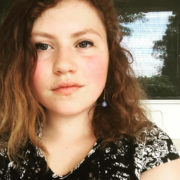 Cade Leebron is an MFA candidate at The Ohio State University, where she serves as an editor at The Journal. Her work has appeared in Electric Literature, Day One, and elsewhere. She can be found online at www.mslifeisbestlife.com, or on Twitter @CadeyLadey.